Having worked in technology within the sports and entertainment field for 30 years, I have a passion for technologies that are leading the charge. Mobile has become the new frontier of the fan experience and it is thrilling to have an effect on that journey. I’m a total technology geek so the most fun part of my job is getting to evaluate a bunch of cutting edge technologies and help decide which ones fit in the Venuetize ecosystem. Talking to people who really “get it” when I show them the platform. Hearing how impressed people are with our technology is really exciting to me and makes proud of what we’ve built. I love anything to do with vegetables…growing them, eating them. I’m a vegan and a total foodie. Fortunately, my wife’s a great chef so I’m pretty lucky. We turned our whole backyard into a garden to keep up with our love of vegetables and most weekends in the summer, that’s where you’ll find me. I had aspirations to be an Olympic ski racer when I was young. Describe your most memorable birthday? 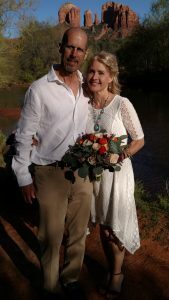 I spent my 60th birthday last year in Arizona seeing the Grand Canyon and getting married to the love of my life in Sedona.